Portée/ is a collective multi-sensorial experience. Through a poetic wandering visitors of the church are invited to explore the spacial & interactive qualities of music. When they touch and trigger vibrations of luminous threads tensed inside the church, the notes associated to each thread are played on an electro-mecanic grand piano. 2014 — Electroluminescent thread, electronic, computer, piano Disklavier Yamaha DC6XE3PRO. Portée/ won The Lumen Prize Performance Award 2015, in partnership with The Welsh National Opera (WNO). Thanks to: Yamaha, Gilles Bazelaire, Gaétan Libertiaux, Marie du Chastel, François Chasseur, Anne Bister, Kikk team & volunteers (including: Nicolas Chasseur, Xavier Dumont, Aurielle Philippartu, Ngân Piquery, Gilles Vandermeeren), Louis Warynski, Eric Bichon, Stéphane Grégoire, Pierric Verger, Sylvie Bekdouche. Notre-Dame d'Harscamp Church, in Namur. The KIKK Festival invited us to create a new installation in a deconsecrated church called 'Notre-Dame d'Harscamp' in Belgium. It's a sumptuous place with magnificent volumes and a great acoustic. Credits photos: Jacques Verrees & Anne Bister. Portée/ is a project at the crossing of light, architecture and music. What if we could express architecture through music? Portée/ is the interactive unfold of a musical score in space and a collective multi-sensory experience. 16 independent electroluminescent wires are deployed in a monumental asymmetric weave of light. Visitors are invited to explore the spacial & interactive qualities of music, through a poetic setting. When they touch and trigger vibrations of the luminous threads, the notes associated to each thread are played on an electro-mecanic grand piano. The melodies are triggered by the visitor but their intrinsic configuration remains out of his control. Referencing the work of Iannis Xenakis, greek composer architect and engineer (1922-2001), the monumental lines evoke a continuous dialogue between mathematics, architecture and music. The proportions of the piece gives way to the gathering of multiple point of views that generate different geometrical outcomes: dynamic, ascending and singular. Each of them offer different ranges of interaction, conditioning simultaneously the intimate experience and global state of the space. The melodies created by french musician Chapelier Fou (Louis Warynski) evolve over time. They blur the frontier between manual and procedural music-score creation and force the visitor to question the origin of the music he’s hearing and his control over it. 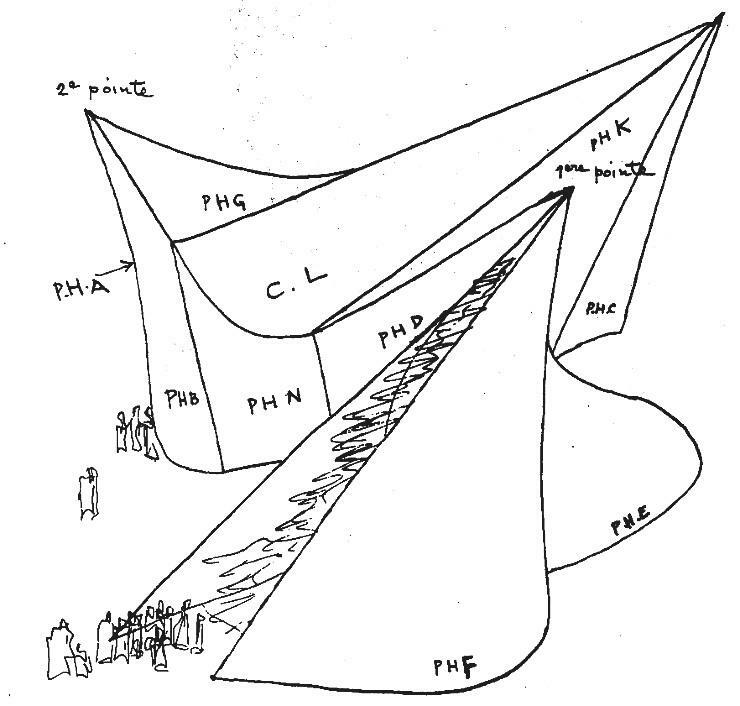 Xenakis was one of the most important inspiration for us, through his research about the dialogue between mathematics, architecture and music. With Metastasis Iannis Xenakis plays with concepts like: rigorous principles, constant evolution and randomness. As we had some obligations due to the place (not hanging elements on ceiling or floor), we opted for a 'light and flexible' installation. We wished to propose to the visitors a 'poetic, illuminated and musical wandering' to change their perceptions of the church. Portée/ was designed to work with one visitor to a group of visitors (around 20 maximum). Design & composition by Louis Warynski - aka Chapelier Fou. With human proportions in mind, we decided to propose a different cross of the church: an asymmetric cross. We also wanted to traduce the idea of ascent in a dynamic and minimalist way. 3D modelling of Portée/ helped us to test and improve the project from several point of views (from the outside, the entrance, the center of the church, the transept...). It was also a great tool for a next step: the setting up of the in-situ installation. The installation uses 16 independant electroluminescent wires each of them connected to custom electronics for the vibration sensing, light animation control and wireless comunication. A rechargeable Lithium-ion 12v battery attached to each wire gives us a complete freedom in the organisation of the wires in the space. Almost all the toolchain used to build Portée/ is Open Source. 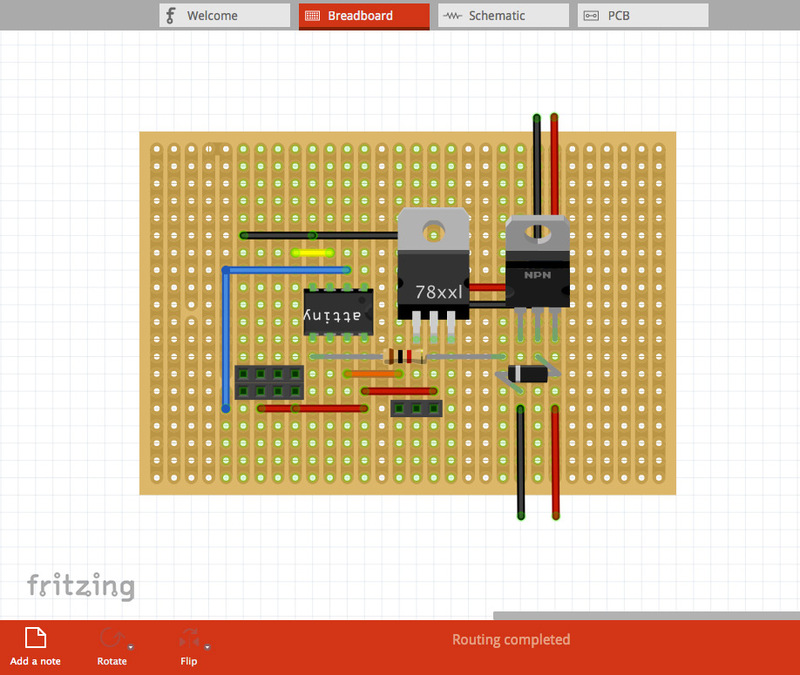 We used Fritzing to design the circuit and PCB, OpenScad to design the Box Enclosure and Arduino to program the ATTiny85 Firmware. More detailed informations on the toolchain, all the components used and links to the source-code of every files used in the project are available in this document. Range & touch detection tests.